Becca’s Hype: Two social updates, one controversy, and a mysterious decision. Welcome to the first Becca’s Hype of November – how are we this close to Christmas already? This week we take a look at new features from Instagram and Facebook (surprise surprise), a Google Docs controversy and a mysterious move by Amazon. If you found yourself scrolling through Instagram at the weekend (who doesn’t) you might have noticed that Instagram are now sprinkling previews of Stories throughout your feed. Previously only found at the very top of your feed, as you scroll you’ll now come across rectangular previews of your friends Stories. It’s quite handy as it shows you what’s in the Story, perhaps enticing you to click, but it’s a little distracting when you just want to scroll to your heart’s content. I can see this increasing engagement rate with Stories and further pushing Snapchat to its death. RIP Snapchat. Last week some Google Doc users noticed that they had been locked out of their own docs due to the content ‘violating Google’s terms of service’. Understandably, this caused uproar on Twitter as people discussed how this could happen, and many started to question if we mindlessly pump too much content into cloud networks without consideration of who’s reading, and who ‘owns’ that content. After much debate about whether this was a form of censorship, or simply a bug, Google published this blog post on ‘protecting Google’s users from viruses, malware, and other abusive content’. Google claims that they ‘mistakenly’ blocked access to some users’ docs and that the bug causing this has now been fixed, with access restored to users. It’s great that Google solved this problem quickly, and assured users that it’s due to user safety that the rules are so strict, a hot topic online at the moment. However, should we be taking a moment to consider where our content is in the cloud and who might be able to gloss an eye over it? Note, that Google’s preventive methods against viruses and malware takes place without human intervention. This time it was just a mistake, but censorship on documents in the cloud is something to keep an eye on from here onwards. Love GIFs? Love polls? Facebook’s got you a treat. 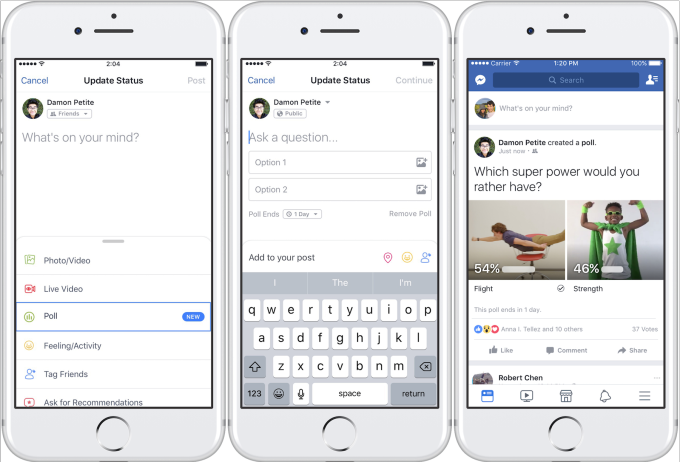 Polls are by no means new on the platform, with users being able to run polls in groups, event pages and Messenger, but now they’re going to have an extra twist. GIFs! And regular images, but GIFs are much more exciting. It’s likely that Facebook have introduced this feature because Live polls (static images played on Live streams encouraging users to vote using one of the reactions) have become so popular on the platform. However, this goes against Facebook’s guidelines – they hate static images on Live streams, don’t do it. I think this new option for polls is going to be great for brands looking to spice up their Facebook strategy – something which is ever harder when you’re fighting against the algorithm. Everyone loves a GIF, and so with the right ones chosen for a poll, engagement should be through the roof. That’s the theory anyway! If you’re keeping an eye on cryptocurrencies (which you most definitely should be, by the way), you might have noticed Amazon purchasing three cryptocurrency related domains last week. Could this mean that Amazon are considering allowing payments via cryptocurrencies in the future, or could it just be for defensive purposes?